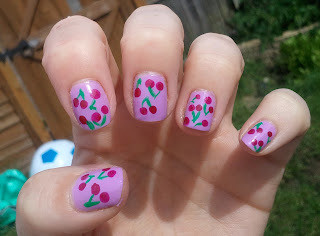 Nail Newbie: NOTD - Cherries! Hi! Just a quick post to show you the nails I created today for the facebook group Polish-aholics Anonymous, which I joined ages ago but never plucked up the courage to post anything or join in the chat! I don't know why, I'm so lame when it comes to things like that. Anyway, every Monday the members have the opportunity to do a themed mani, and this weeks theme was fruit. I had the idea for this manicure in my head for a while, so I thought I'd grab the bull by the horns and give it a try. So glad I did! The colours I used were Barry M Berry Ice Cream as the base, 17 Fast Finish Ruby Dazzle for the cherries (with a dotting tool) and Barry M Spring Green for the stalks (with an old eyeliner brush). Topped with Seche. Really simple and I love it. I posted it in the group and got some lovely comments too :) My two index fingers (which both have bad splits) chipped really badly throughout today, and usually I would take the whole mani off and do something different, but I just took the polish off the chipped fingers and redid them, that's how much I love it! One last thing before I go to bed, I've made it to 100 followers! I am absolutely amazed that people want to look at my carcrash nails and read my unfunny ramblings, so thank you! I want to get a couple more polishes to add, and then hopefully my giveaway will be up tomorrow evening, or Wednesday morning. Thank you again! And if you follow me and I haven't followed you back (I do try to, but blogger doesn't co-operate most of the time sometimes) then please email or tweet me your links, the details are in the "Contact" tab above. These are just soo precious ! TOTD - Toes to match my shoes! 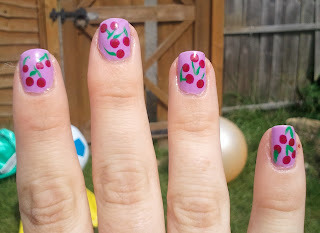 Pink Wednesday - Strawberry nails! My sash and how I store it!